Yesterday’s Wall Street Journal had a column by Brett Arends in which he wrote positively on a relatively esoteric strategy, namely investing in the S&P 500 index while writing (i.e. selling) call options on that index. It’s just the sort of thing that, in a different time and place, big media journalists would condemn as the foolish scheme of too-clever-by-half financial engineers. I never know how much or how little to explain about the mechanics of financial instruments, but since I generally advise folks to steer clear of options, I will assume that a relatively long explanation of what Arends is talking about is in order. So excuse me if the next few paragraphs are painfully obvious for you. A call option is an option to buy something at a specified price for a specified time in the future. So you might have an option to buy a share of GM stock at $5 on June 30. If on June 30 GM is trading above $5, then your option is “in the money” meaning that the ability to buy at that price is worth something. (It’s worth the difference between the current price and $5.) If it is trading for less than $5, then the option isn’t worth anything, since buying at $5 would be pointless. As a practical matter, stock options don’t usually get exercised, that is, you don’t actually buy the share of GM for $5. What generally happens is that you sell the option for what it is worth, the current price of GM less $5, and the person who issued (“wrote”) the option buys it back from the market for that same price. Writing options is like being a bookie. You take bets and collect money (“premiums”) and pay off the winning bettors with the proceeds. If you are good at it, you take in more than you pay out. The covered call strategy that Arends suggests is to invest in the S&P 500 index and then write calls on it. Your position in the options is hedged, since if the S&P goes up, although you will have to pay off the option buyers, you also make money on your underlying S&P investment. You are, essentially, repeatedly selling off your upside potential in the index. You will not participate in upswings, and will suffer in downdrafts, but will have a nice constant stream of income from the option premiums to mitigate your losses and (hopefully) make it all worthwhile. Relative to a plain vanilla S&P position, you will do better when the market is down or flat, since you have the same stock returns plus the option premium, and worse when the S&P goes up, since you sold that upside in exchange for the premium. The reason why this works is, according to Arends, that “Call options are usually overpriced. Those who sell them tend to make more money than those who buy.” An appropriately skeptical investor might wonder if it could be possible to make money that easily. And yet, the numbers seem to bear this out, or at least they used to. For the period 1988 to 2002, the S&P 500 averaged a return of 0.98% a month, with a volatility of 4.31%. (If the volatility number means nothing to you, don’t worry about it. Smaller is better. Trust me.) Over the same period the CBOE BuyWrite Index returned 0.99% a month with a volatility of only 2.41%. So the call writing strategy got you the same return as the S&P with only a little more than half of the risk. That’s pretty cool. But easy ways to make money (or reduce risk) don’t last long on Wall Street. This particular strategy started to get some serious buzz in the earlier years of this decade. Funds were started to take advantage of it, papers were written describing it, and the CBOE started publishing its index in 2002. 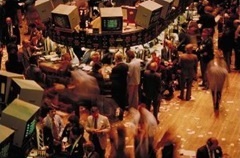 When the market hit lows in 2003, the idea of a lower-risk alternative to just buying the index appealed to a lot of investors and money started flowing into the strategy. Inevitably, all those folks competing to sell overpriced call options drove the prices of those options down and the strategy hasn’t been the same since. From 2003 to date, the CBOE index has returned 0.22% a month with 3.24% volatility, against 0.17% a month and 4.10% volatility for the plain S&P. So the strategy had a similar return for 80% of the risk, rather than 56% as before. That may still sound like an improvement, but consider that you can manufacture 80% of the S&P volatility by selling 20% of your S&P position and putting the money in a money market fund. And over the period in question, money market funds actually outperformed the S&P, so an 80/20 mix would have been both lower volatility and higher return than the straight index. Moreover, the period since 2002 was particularly dismal for stocks. The call writing strategy is one that underperforms the index if the index goes up, and beats it if it goes down or sideways. A period in which the market went more down than average should have been a great period for this strategy, and yet it did just okay. And if case you are the kind of person that is attracted to the 0.05% monthly advantage that the CBOE index had over the S&P (and if so, you’re my kind of person) remember that implementing the strategy is not free. Selling all those options will incur transaction costs, and if you invest in a fund that follows the strategy you will pay management fees on top of that. Arends, of course, doesn’t point out that the covered call strategy hasn’t really worked since it became well known. Instead he cites the two studies available on the CBOE website, rehashes some out-of-date data, confuses a closed-end fund with an ETF, and calls it a day. He has blind faith in an automatic “system” for investing. Bah. No such “system” can ever work. If it did, everyone would adopt it, and who would be left to underperform? Successful investing is an art as well as a science. It’s pragmatic. It involves judgment. I agree that the call options idea is too complex. What approach to investing doesn’t involve going with some sort of “system”? The idea that no “system” works is the big argument you often hear for Passive Investing and I view Passive Investing as the biggest “system” of them all. It claims to be the one approach that is so neutral that it cannot fairly be characterized as a “system.” Yeah, right. I think the answer is to educate people (including ourselves, to be sure!) as to how stock investing really works. When you understand the ABCs, you can at least recognize it when you are falling for A System That Claims Not To Be A System. You’ll still end up using some form of system, but if you understand what you’re doing you’ve got a fighting chance of going with a system that makes sense for someone in your particular circumstances. Ah, such is the world of having too much space to fill and not enough good content to fill it. This is one of those things this dude probably wrote 6 months ago and put it up because he had nothing else that week. The thing that I really noticed about Arends’ article was that there was no statement like “but please, be sure to do more research on options and how they work before getting involved in them” sort of statement. The mental image of somebody (who has heretofore simply been DCA’ing into a set of funds) reading Arends’ article then going out and delving into the world of options makes me cringe. Cool stuff… so after everyone discovered it people just priced call options properly? So that’s the only point of traders right (in a grand-scheme point of view)? It’s not fair to refer to writing covered calls as a gimmick. It’s a viable investment strategy for the right investor. That means it’s not for everyone. No sir. The shares change hands when an option is exercised (at expiration, or any other time). Options really can be used reduce risk when investing. It makes me cringe also. But no more so than taking the position that options are something bad. Options are conservative, risk-reducing investment tools, when used appropriately. And that means after learning how they work. I meant to say that this particular scheme, the long term strategy of holding the index and writing calls as per the CBOE index and using that as a substitute for an S&P 500 investment, was a gimmick. Writing covered calls in a general sense is a legitimate strategy in some situations for people who know what they are doing. And you are, of course, right about an option for GM actually being excercised when it is excercised. I meant that as an investor you generally wind up with cash, not a share of GM. I’ll edit the text appropriately. In any case, the index options discussed here are cash setttled. It’s not that no system works forever, it’s that no system will beat the average market return forever. Once a trade or system is found that can give better returns than the normal market, people pile into that and the margins get squeezed until it is no more profitable than the market. this is the case in business as well as the stock market.